Can you imagine the original Bioshock without the Big Daddies on every level? In this interview with Ken Levine about the forthcoming Bioshock Infinite, he talked about the issues they had shaping and developing that game’s character Elizabeth and how some fellow game creators wanted to cut her from the game. As part of that he said "I would be in reviews and ask ‘Where is Elizabeth?' and they would say, 'Oh, she's in a closet,'" Levine said. 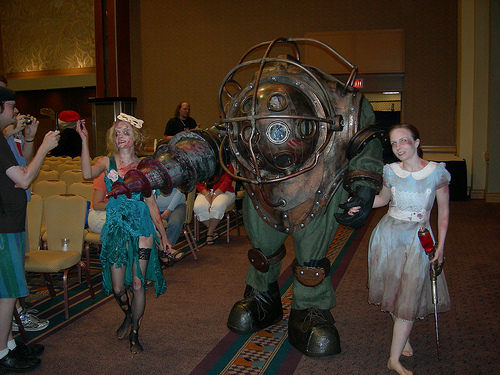 "The same with (BioShock's) Big Daddy. I actually had to insist that there were three Big Daddies in every level." Can you imagine the original Bioshock without the Big Daddies on every level? Looking back it would seem such an odd thing Ken needed to insist on being in the game as the Big Daddies were such an integral part of the game. They were so much fun to bring down – it was extremely satisfying setting traps for them! While good design and planning is crucial to making great video games, this nugget of info from Ken shows that you need leaders who know what they want and leaders who have the ability to get what they want into their games.